Omaha Beach arrived in Louisville, Ky., on Tuesday afternoon, and a short time later, his rider for the Kentucky Derby was confirmed. 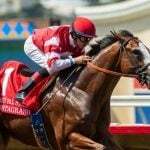 According to the Daily Racing Form, jockey Mike Smith told trainer Richard Mandella that he would take the mount on the Rebel Stakes (Division II) and Arkansas Derby winner. Smith faced a tempting choice. 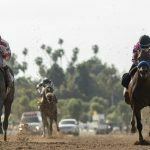 Besides riding Omaha Beach to his second straight graded stakes win in Saturday’s Arkansas Derby, he also guided Roadster to the win 10 days ago in the Santa Anita Derby. Smith’s racing style earned him praise in both colts’ most recent victories. At Santa Anita Park, he kept Roadster at the back of the pack until the final 3/8ths of a mile. From there, Roadster took command and chased down Breeders Cup Juvenile champion Game Winner on a fast track. In the Arkansas Derby at Oaklawn Racing and Gaming, Smith kept Omaha Beach near the front early on the sloppy track. Then, in the first turn, the colt had a lane on the outside. That allowed Smith to ease him into the lead, which he kept for good. Down the stretch, Omaha Beach withstood a strong rally by Improbable, pulling away to win by a length. 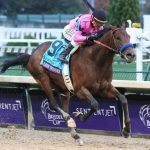 Smith’s decision should bolster Omaha Beach’s argument as the presumptive favorite heading into the May 4 race at Churchill Downs. The 53-year-old has won more than 5,400 races, including all three legs of last year’s Triple Crown with Justify. William Hill in Nevada lists Omaha Beach at 7-2, while the Westgate SuperBook moved him to 7-2 from 4-1 after Smith’s announcement. The SuperBook put Roadster as its favorite at 3-1. Elsewhere, Roadster, Omaha Beach, and Game Winner are listed at 6-1 at USRacing.com. Improbable is next at 9-1. Sportsbook.ag gives Omaha Beach 4-1 odds, with Roadster at 9-2, followed by Game Winner, Improbable, and Florida Derby winner Maximum Security at 5-1. Bob Baffert trains Game Winner, Improbable, and Roadster. 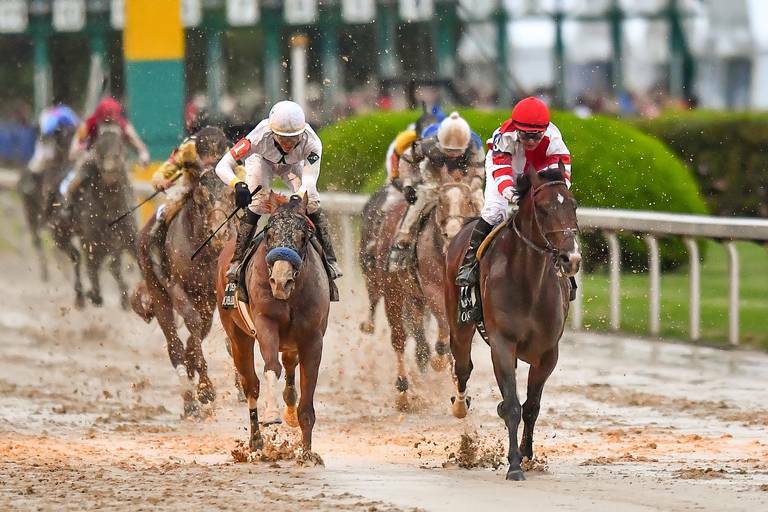 I still think Bob Baffert will have something to say about who wins the Derby, but at this point, I’m giving Omaha Beach a slight edge based on what I saw in Arkansas,” said Jody Demling, a horse racing handicapper for Sportsline.com. After the Smith news broke, Baffert quickly settled on his new jockey. The Frenchman doesn’t have a Derby win under his belt, but the 32-year-old has won more than 1,160 races. That includes the 2017 Breeders Cup Classic with Gun Runner and the 2018 Kentucky Oaks with Monomoy Girl. Omaha Beach wasn’t the only Derby horse to arrive at Churchill Downs on Tuesday. Tacitus, who won both the Tampa Bay Derby and the Wood Memorial, arrived at the track in the morning. That brings the total of Derby entrants already at the track to seven. The others include Country House, Louisiana Derby winner By My Standards, Improbable, Rebel Stakes (Division I) winner Long Range Toddy, and UAE Derby winner Plus Que Parfait.